DMV.com was created to help simplify your life by providing you with all the vehicle related information and Utah DMV services you may need, in one place. Quickly find information and services regarding driving records, vehicle registration, drivers license renewal, license plate renewal, getting a learners permit, and finding a Utah Department of Motor Vehicles approved traffic school. A DPS drivers license is required for Utah drivers. Find comprehensive UT drivers license information about renewal, reinstatement and more. Get your Utah DMV driving record without having to wait at the DMV office. Ordering Utah driving records online is fast and convenient. Auto insurance is required by the Utah DMV for resident vehicle owners and operators. Find affordable UT car insurance online today. Completing Utah traffic school can allow a driver to remove demerit points. Learn additional benefits of a driver improvement course in UT. Take a Utah DMV practice test before signing up for the written test. Our DMV practice exam will improve your chance of earning a license. Car registration is required by the UT DMV. Learn about replacing car registration documents, renewing car registration documents and more. Utah drivers education is a DPS requirement for license applicants who are 18 years of age or younger. Learn more about UT drivers ed. A Utah vehicle bill of sale is a receipt from a car sale. Learn how to obtain a bill of sale from the UT DMV quickly and easily. Traffic citations in Utah require the driver to respond. Learn how to pay a speeding ticket and how to fight speeding tickets in UT. Utah DUI laws mandate fines, suspension and other DMV penalties. Learn more about DUI consequences in UT, and find other DUI information. Buying a car online in Utah can make your registration process easy. Find resources to help you buy a new car or used car in UT today. 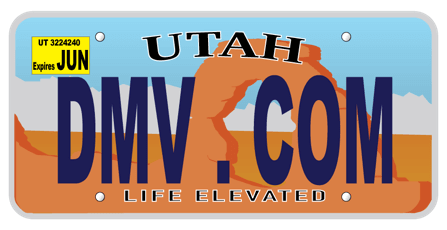 Find Utah DMV locations, and obtain DMV contact information. Drivers may need to visit a UT DMV office to access some services. Let us welcome you to our guide to the Utah Division of Motor Vehicles. DMV.com is the easiest way to find information regarding Utah DMV. The website is privately owned and allows you to collect information without getting stuck in government bureaucracy. If you want to find out more about Utah’s Devision of Motor vehicles, the types of regulations and forms that need to be filled, take a look at our list of useful articles. We provide you with info on vehicle registration, how to obtain a driver’s license, how to renew/replace your driver’s license, credit scores and more. Using the guide won’t be a problem at all. Start with the “search” feature or use the navigation sections to find the exact information you need fast. No matter what type of vehicle you own, we offer you a step-by-step guidance towards obtaining or renewing your driver’s license, getting your driving record, and much more. We would also like to invite you to contribute to making the site even better by visiting our Facebook page, giving comments on the articles and asking questions as well.